So many memories from this place! Those who only venture from their hotel room to the parks may not be aware that some of the best dining experiences are located outside of the parks. 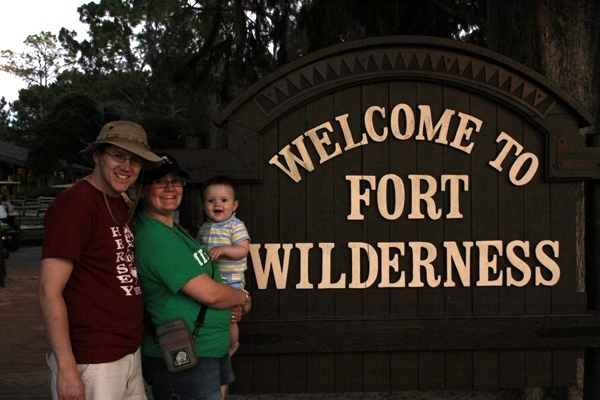 We always stayed in Fort Wilderness growing up so our transportation to the Magic Kingdom was by boat. On the way to the dock we would always pass The Hoop-Dee-Doo Revue. 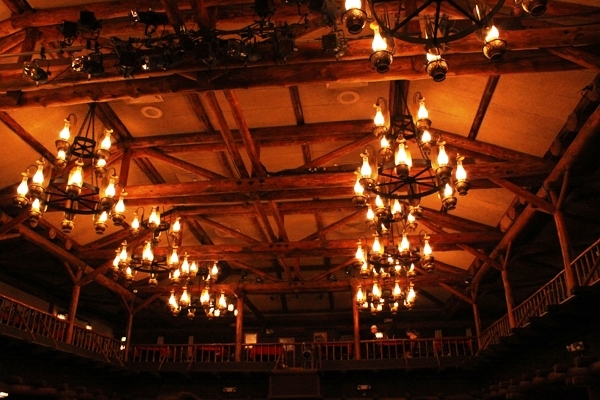 We could not go to WDW all those years and pass by The Hoop-Dee-Doo Revue all those times without checking it out. It is there that I had one of my most memorable experiences as a child. When you step into Pioneer Hall you step back in time. Upon entering the rustic dance hall you take on the role of a cowboy or cowgirl of the old west just looking for a little grub (or a lot) and some old fashioned entertainment. You can be assured you will get plenty of both while dining in Pioneer Hall. They treat you as if you just returned from driving cattle on the plains for the past week eating nothing but beans from a can. Dinner is served family style. Literal pales of fried chicken, BBQ ribs, baked beans, vegetables, and cornbread are slammed on your table an keep getting refilled as long as you keep emptying them. The generosity at Pioneer Hall extends to their beverages as well. Not only are there bottomless mason jars of sodas but also draft beer, wine, and sangria! Unlimited alcohol is surely a rare find on WDW property but let me assure you it is not needed in order to be entertained by the Pioneer Hall Players. It is definitely one of the most interactive dining experiences on WDW property but quite possibly one of the most interactive shows as well. The Pioneer Hall Players are good at what they do and what they do is make you laugh and make you part of the show. I don’t want to give too much away because I think you should check it out yourself. I will say that the Pioneer Hall Players are not always on the stage and you may not always be at your table. It has been the same show for years which is a testament to its success but I have heard rumor of recent changes. The show is full off musical numbers, dance routines, and classic Disney gags and jokes. A few lucky guest might just land a role in one of the skits. I have personally managed to play two of the four roles. One as a young hero who comes in to save the day from a dangerous Indian and the other as…well the dangerous Indian. To be honest, I don’t really know the story line of that skit because both times I remember going I was in the skit and between focusing on my role and the excitement and adrenaline everything except what I did is bit of a blur. Eating from buckets and drinking from mason jars…WIN! Eat light the day you plan on dining at Pioneer Hall because it is all you can eat of comfort food straight out of the old west! 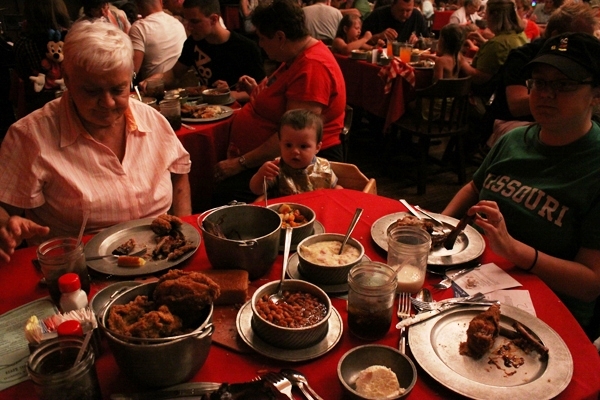 As much fried chicken, BBQ ribs, baked beans, vegetables, and cornbread as you can cram down before dessert! The fried chicken was good but I was cramming down the ribs, beans, and cornbread. I can’t remember what the vegetable was. Why waste your time with vegetables? As you’re chowing down on dinner you may not want to forget about dessert (or maybe you do) which is a hefty serving of strawberry shortcake which is presented in a way that makes a bigger deal out of it than I think they should. If I were you I would stuff yourself with dinner or make plans to get dessert elsewhere. Overall, I think the Hoop-Dee-Revue is a must Doo (see what I did there?) at some point. It may seem a bit pricey but the food (quantity and quality), entertainment, and atmosphere is totally worth it! What do I mean by pricey? 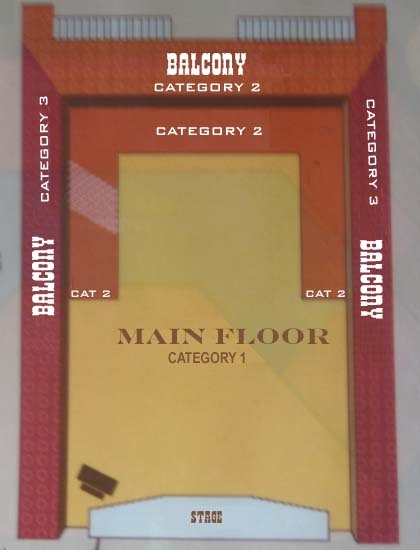 There are three categories for seating: category 1 is $67.99, category 2 is $58.99, and category 3 is $58.99. I would recommend making advanced dining reservations if you would like to eat here as there are only3 shows a day. This entry was posted in Food, Restaurant Review, shows and tagged bbq ribs, food, Pioneer Hall, restaurants, travel, vacation, Walt Disney World. Bookmark the permalink. Hoop-De-Doo was always one of my favorites as well. I’m surprised you didn’t mention that you can use Disney Dining credits on the dining plan to go see the Hoop-dee-doo Review as well. It just takes 2 credits instead of 1, but it is totally worth it! Fun for the whole family. 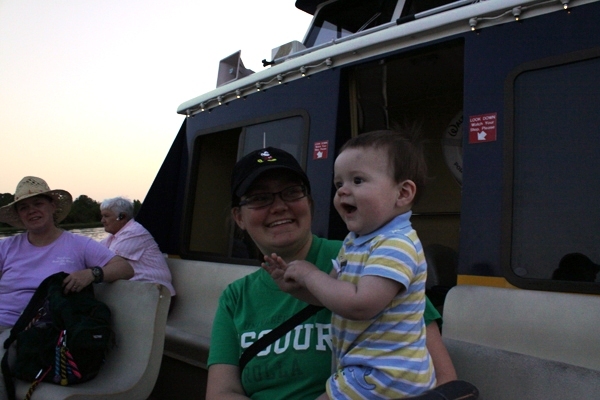 Jared (seen in pictures above) was only 10 months old when we went to Hoop-dee-doo. 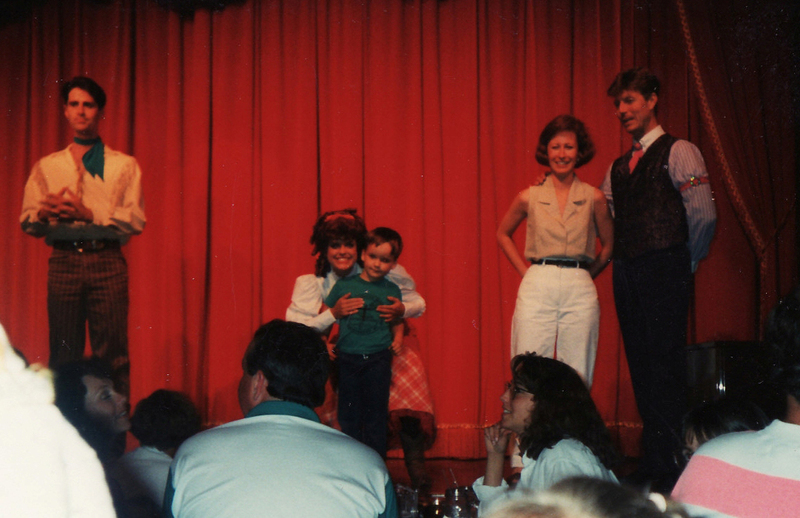 While he was too young to understand the jokes, he thought it very funny when everyone else in the room started laughing, so he joined in too. It was the most animated I saw him the whole week at Disney World. So it truly is fun for the whole family! Great point kb! Although…whether it’s worth 2 credits is a toss up for me because if you divide the price in half I know there are some restaurants where I can spend at least that on just the entree plus getting to experience two different restaurants instead of one. I know after my review it might sound like a contradiction but the current price for the dining plan is $51.54 per day so you would be losing money if you paid for the dining plan and used 2 credits. I would just recommed paying out of pocket for this although if you do nab the free dining plan it would be easier to spend 2 credits like we did.